In the code behind for both main pages I created a data context from a viewmodel class that is defined in the UpTimeUni.Shared project. This means it will be available from both apps. Here I’m using Fody to automatically implement all the INotifyPropertyChanged boilerplate code, hence the [ImplementPropertyChanged] attribute. This relies on installing the PropertyChanged.Fody NuGet package into both the app projects. 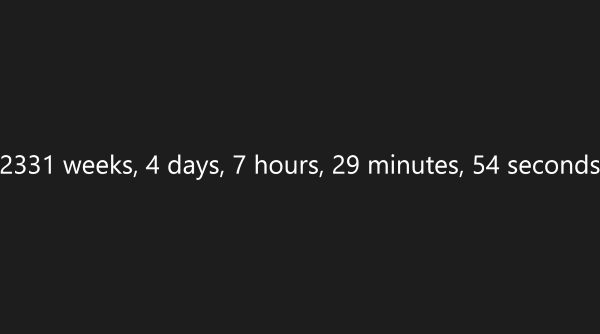 Now running the Windows Store app we can see the app updates with the Internet uptimes every second. So next I changed the startup project to the phone app and running showed just a blank screen. At first I thought I had messed up the XAML binding but this was fine. I put a breakpoint in the viewmodel’s UpdateTime method but it never got hit, it was never getting called from SignalR. After some searching online I found a Stack Overflow comment that suggested you need to configure SignalR to use long polling when running in the emulator. I don’t have a Windows Phone 8.1 device to check this on outside of the emulator at present. Running the phone app now works as expected. Once I update my phone to 8.1 I can see if this behaviour is just an emulator quirk. If you strip away all the additional stuff, it’s effectively just 4 lines of code to receive SignalR messages, which is pretty amazing.